Victoria Loco reached the final of the Miller Cup with a battling 3-0 victory over Edinburgh University at Forrester High School. In an end-to-end opening period, it was Loco who took their chance in front of goal. Danny Waddell made a well-timed run into the box and he steered home Shaun Dunn’s ball from the right at the front post. The Uni came close to equalising with a blistering Harold Buchardt free-kick that flew just over the bar from 25 yards. However, Loco again showed clinical finishing to extend their lead. Bryan Ferry chested down Darren Aird’s free-kick to blast in a volley past Uni goalie Scott Hainey from just outside the area. The second half began with the Uni looking lively, but Loco defended resolutely and built on their efforts at the back to secure victory with a third goal of the game. Omar Ali bust a gut down the left flank to get in behind the Uni defence and squeeze the ball past Hainey from a tight angle. 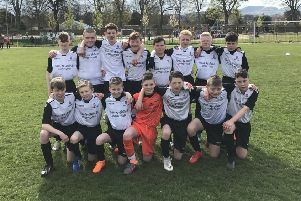 Loco now meet Blackridge Vale Of Craig in the final after they defeated North Merchiston Vale on penalties in the corresponding last-four tie. Redhall Star took another step closer to promotion as they wrapped up a deserved 3-1 victory over Forth Community Amateurs at Kingshill Park. The Lothian West leaders picked up a precious three points but that win was by no means straightforward. Forth were awarded a penalty early on in the first half as Redhall’s Denis Staskewitch fouled Dean Gibson in the area. Gibson dusted himself down and put away the spot-kick. Redhall worked their socks off to get back into the game but Community held firm till the break. However, early in the second half, the hosts’ resistance was finally broken. Greg Weir was fouled in the box and Staskewitch made up for his earlier mistake by dispatching the penalty. With that, Forth lost focus and Redhall took full advantage as Jamie Aitchison headed in a second. Then, late on, Redhall sealed victory as Ryan Mullen latched onto Richard Laing’s pass to convert. Redhall are inching nearer promotion to the Championship but have Craigshill Thistle on their tails, just four points behind in second place with four games in hand. East Linton gave their Premier Division title hopes a boost as they defeated Linlithgow Thistle 4-2 at Memorial Park. With the season drawing to a close, it was vital for the second-placed side to keep up with leaders Edinburgh Rose and they did just that, dealing fellow high-flyers Thistle a blow in the process. Linton deservedly took the lead midway through the first half as Jules Anderson headed in and they grabbed another soon after as Michael Mcfarlane followed up Bob Wood’s free-kick. Thistle battled hard to pull a goal back just before half-time with Sean Smith scrambling the ball home from close range. Then, after the interval, they grabbed another as Lee Fairley finished from close range to make it 2-2. East Linton doubled their efforts to get the win. Mcfarlane once again showed composure in front of goal to steer home to put his side back ahead. Then, late on, Wood cemented the victory, showing some smart footwork to score from close range.